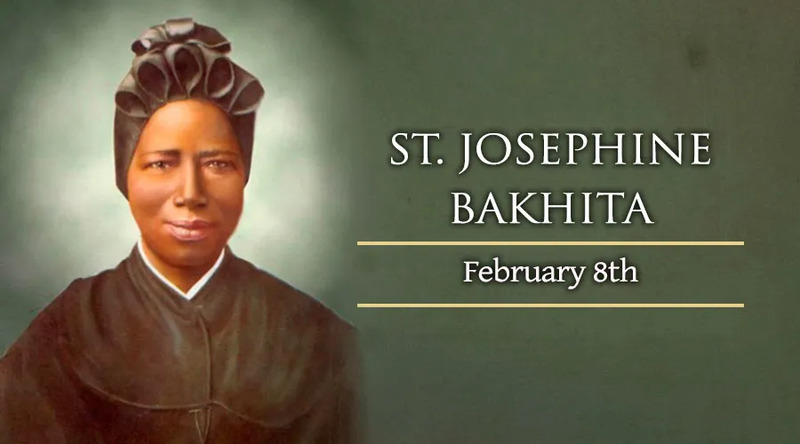 On February 8, the Church commemorates the life of St. Josephine Bakhita, a Canossian Sister who was kidnapped and sold into slavery in Sudan. Josephine Bakhita was born in 1869, in a small village in the Darfur region of Sudan. She was kidnapped while working in the fields with her family and subsequently sold into slavery. Her captors asked for her name but she was too terrified to remember so they named her “Bakhita,” which means “fortunate” in Arabic. Retrospectively, Bakhita was very fortunate, but the first years of her life do not necessarily attest to it. She was tortured by her various owners who branded her, beat and cut her. In her biography she notes one particularly terrifying moment when one of her masters cut her 114 times and poured salt in her wounds to ensure that the scars remained. “I felt I was going to die any moment, especially when they rubbed me in with the salt,” Bakhita wrote. After being sold a total of five times, Bakhita was purchased by Callisto Legnani, the Italian consul in Khartoum, the capital of Sudan. Two years later, he took Bakhita to Italy to work as a nanny for his colleague, Augusto Michieli. He, in turn, sent Bakhita to accompany his daughter to a school in Venice run by the Canossian Sisters. Bakhita felt called to learn more about the Church, and was baptized with the name “Josephine Margaret.” In the meantime, Michieli wanted to take Josephine and his daughter back to Sudan, but Josephine refused to return. The disagreement escalated and was taken to the Italian courts where it was ruled that Josephine could stay in Italy because she was a free woman. Slavery was not recognized in Italy and it had also been illegal in Sudan since before Josephine had been born. St. Josephine was beatified in 1992 and canonized shortly after on October 2000 by Pope John Paul II. She is the first person to be canonized from Sudan and is the patron saint of the country.